This is the vehicle we had to use in South Africa. The reason is that the south African government requires all overland vehicles in operation in South Africa to be South African vehicles. Or some other silly rule. 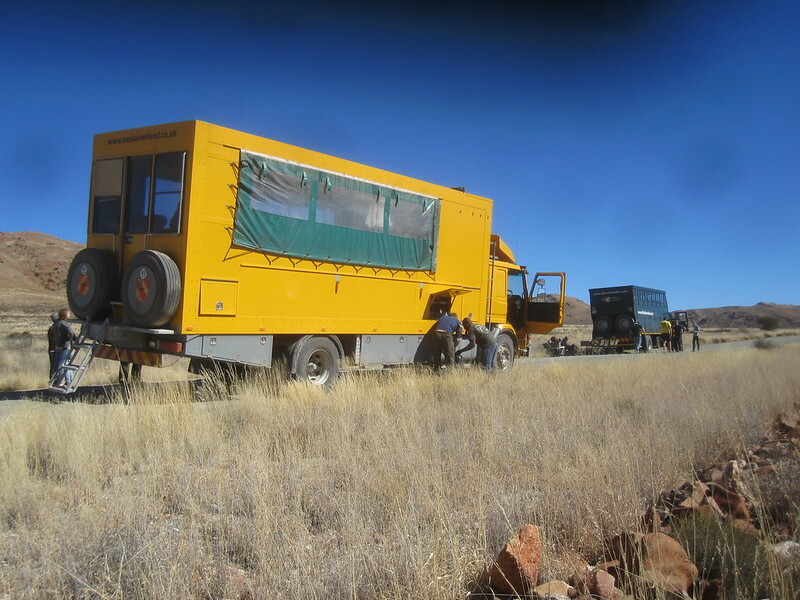 I saw many other overland vehicles in South Africa but not any from the overland company I used. 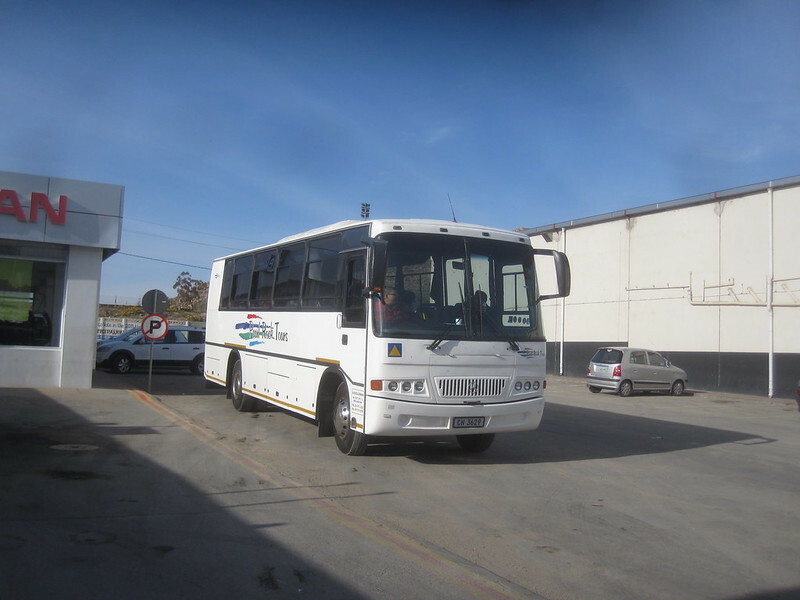 This means that we got up early in the morning, made the border crossing from Namibia into South Africa, transferred our bags and persons to the bus pictured here and then high-tailed it into Cape Town. No camping or other recreational activity. Just scoot. We arrived around 4:30 PM. We checked in. We grabbed some refreshments and had our departure dinner at 7:30 PM. It was a touching moment. This entry was posted in Travel and tagged Africa, Cape Town, Namibia, Overland Trip on July 28, 2012 by Steve. As I said before, it was a really nice campground. The problem was that it was located several miles from anything else. There was nowhere to go and not a lot to see at the campground. I guess the whole point was to lie around and relax. Sounds good, but I was pretty well relaxed-out. It seemed that a high percentage of the campgrounds that we went to in Africa were of the same variety. I’d call them destination campgrounds. The problem for me was that I wasn’t really trying to find destination campgrounds. I tend to be a bit more active than that. In the end I realized that an overland trip was a lot more restrictive than I needed it to be. Maybe I’m just not a relaxed, destination-campground sort of traveler. This entry was posted in Travel and tagged Africa, Namibia, Overland Trip on July 28, 2012 by Steve. It may well have been the nicest campground that we stayed in the whole time I was in Africa. It had a beautiful setting on the Orange River where several of the group took a canoe trip from the campground. The swimming pool was great. The bathrooms were ultra-clean and there was more hot water than I could use for a shower or doing my laundry. They had internet that was very spotty, but when it worked it was excellent. The only problem was that it was out in the middle of nowhere and we were there for two days and there wasn’t a lot to do. 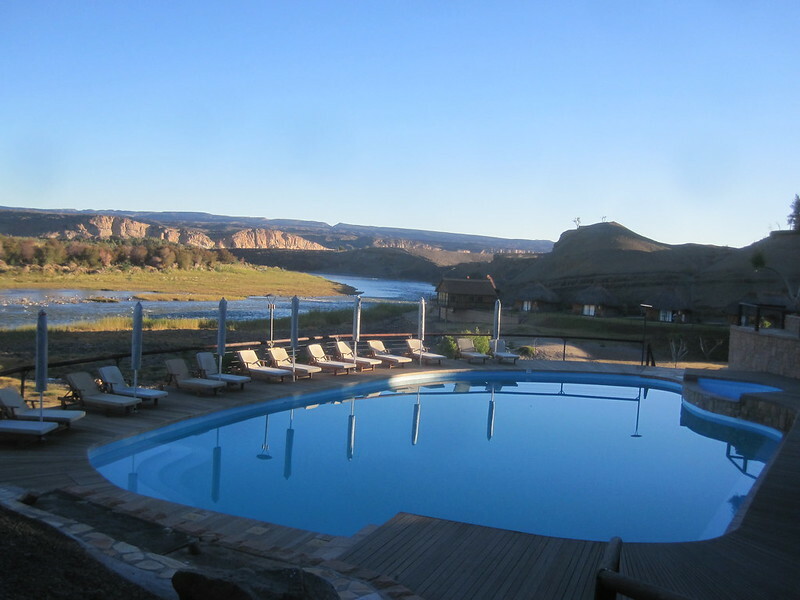 Fish River Canyon is the second largest canyon in the world. Or so we were told. It sounded reasonable to me. It looked pretty big from where I was sitting. The picture is me at the start of the hiking trail which is 80 kilometers (48 miles) long. It takes 5 days to hike it and costs $11 to go on the trip. Sounds like a bargain. I just did not have the time. I probably did not have the energy, either. I was told that we had to carry almost 50 pounds of water for the 5 days, plus gear. The gear I could manage, but I’m not sure I could manage the 50 pounds of water. 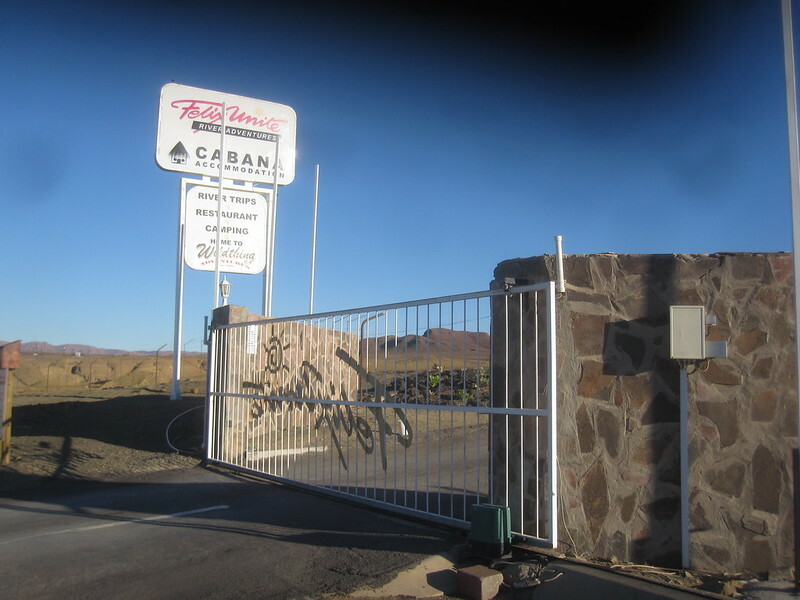 This entry was posted in Travel and tagged Namibia on July 28, 2012 by Steve. What does an overland truck do when they run out of fuel? They sit and wait until someone comes along that is willing to help them. In this case the someone who will help them is the overland truck on which I was riding and the truck out of fuel was a competitor. Dave, our driver, gave the other driver enough fuel to get him to a fuel source. It took a while. While they were making the transfer, the passengers in our truck and their truck had a little get-together. All of the people in the other truck were from the Netherlands. They seemed really nice and I felt that I liked them until they told me they had a full-time cook on board. After that I did not like them as well. This is Dune 45, one of the most photographed sand dunes in the world. It is located in Sossusvlei, a huge salt and clay pan set among sand dunes that rise as high as 1,000 feet and cover and area of almost 20,000 square miles. 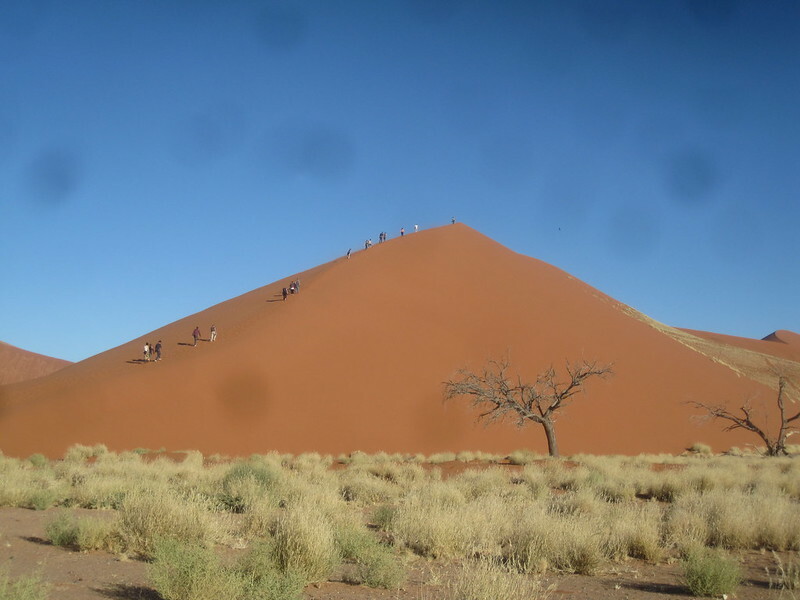 These sand dunes are Namibia’s #1 tourist attraction, according to the Lonely Planet web site. We stopped at Dune 45 for about an hour-and-a-half so people could take some pictures and do a little dune climbing. Luckily, no one got lost. I liked it the minute I saw it. It was built sometime around 1909. The tower was originally called the Damara Tower as that was the name of the company that used it. It was supposed to be a landmark for ships in the era when it was built. There were some really great views from the tower as there were no other building that I could see that were taller than the tower. It cost me $2 to get to climb the tower’s viewing area. I thought that was fair although I sometimes wonder why I pay money to walk up several flights of stairs. It seems like its a special kind of tourist punishment. 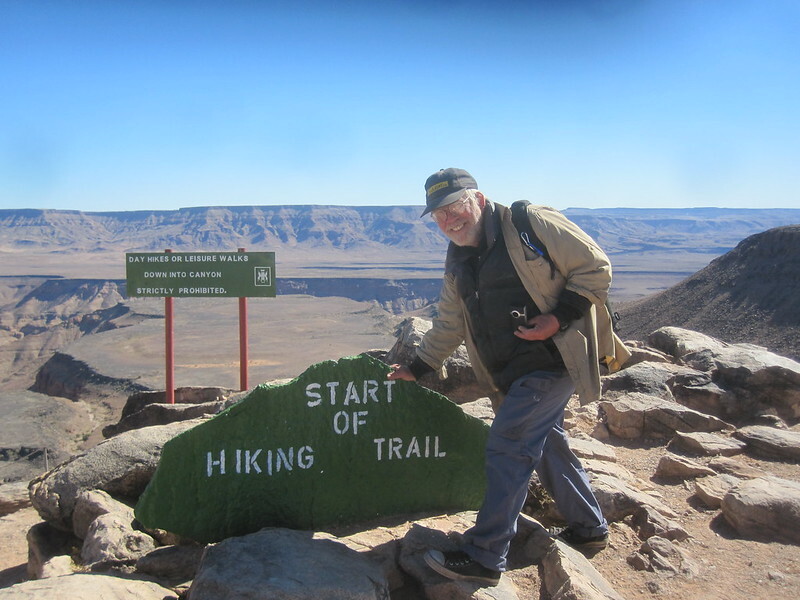 This entry was posted in Travel and tagged Namibia, Swakopmund on July 28, 2012 by Steve. 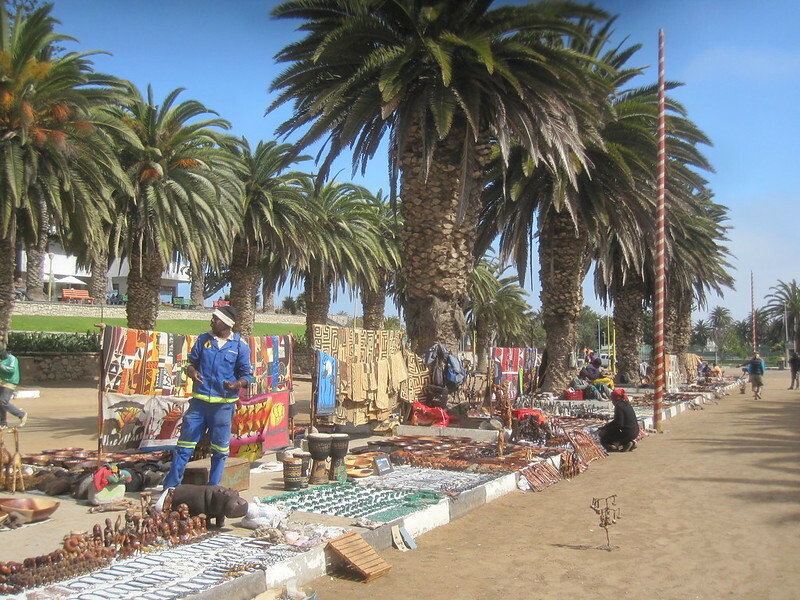 It’s the local craft market in Swakopmund. It was the only one I saw that wasn’t housed inside. Everyone wanted to help me buy something. There was a lot of choice. When I asked someone if they were there everyday, he said yes. They were close to the museum and the light house. Swakopmund is not a big town. This entry was posted in Travel and tagged Market, Namibia, Swakopmund on July 28, 2012 by Steve. 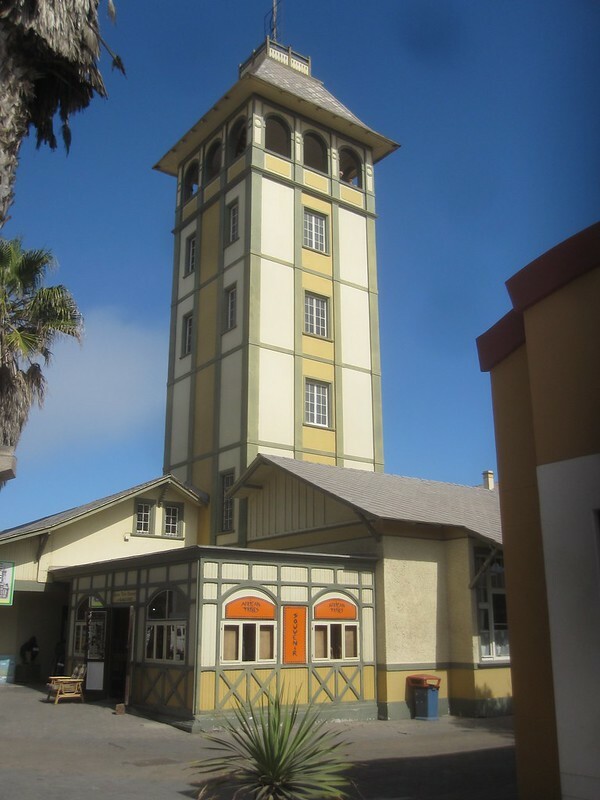 I went to the museum in Swakopmund. It cost me about $3 and I figure that’s about the right price for it. The area it is in is interesting. It’s sits on the beach as you can see. It also sits right in front of the lighthouse, which was also interesting. There were a couple of outdoor cafes next to the museum which seemed to draw a crowd on a Saturday morning. There was also a little kiddie park next to the museum. All-in-all it was something of an active place. This entry was posted in Travel and tagged Museum, Namibia, Swakopmund on July 28, 2012 by Steve. 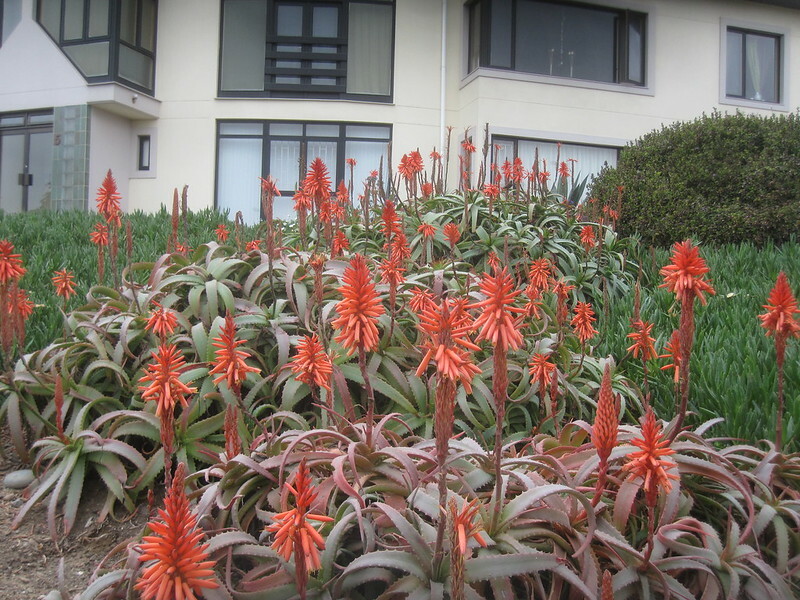 I went for a walk and found these flowers. The picture does not do them justice. 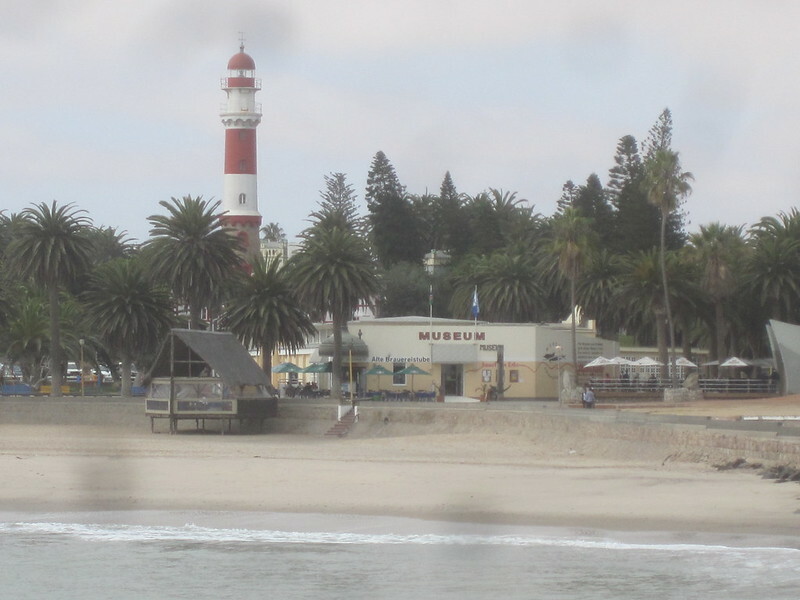 Swakopmund, Namibia was an up and coming town. It was modern and landscaped nicely. I saw some civic pride in the town. The urban landscape in Africa can, at times, be a little less well-groomed than a local progressively minded citizen might want. Swakopmund had no such distinction. It was a tidy place. This entry was posted in Travel and tagged Africa, Namibia, Overland Trip, Swakopmund on July 28, 2012 by Steve.